Kent's "Hooligan Libertarian" Blog: Call a Crackhead? I saw the attached picture on "social media". So, apparently, to cop lovers there's no choice other than either inviting cops or calling a crackhead? Nothing in between those extremes? 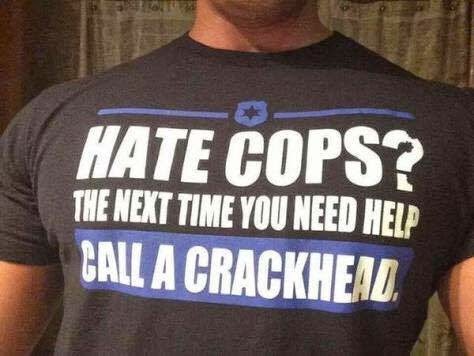 Seems silly to me, but if that were the only choice, calling a crackhead would still probably be the wiser choice. But, what about this: Why not set up an alternate "emergency number" to compete with 911, but one to be monitored by volunteers. No "tax" money involved, so no coercion or theft required. Since no one would be forced to call them in an emergency, not being the only game in town, they would have incentive to "police" their own ranks and keep out anyone who creates problems (or murders at the drop of a hat), or who seems twitchy and potentially dangerous- you know, opposite of how cops operate. I think lots of people would love to join such a group. And, instead of the has-been high school bullies attracted to the police department, its shiny trinkets, and gangland opportunities, you'd get people who actually want to help. Not those who want to throw around "authority" and enjoy a license to kill. When you call this number and someone shows up, if you don't want that person's help because you know the individual and don't trust them, or because they are escalating the situation, send them on their way. They might think you unwise, but if they didn't leave they'd be trespassing and would be liable. And there would be no "qualified immunity" or FOP to hide behind. Since they would have no "authority" to kidnap ("arrest") beyond what any other person has (you know, the way cops are actually supposed to be) there would be no great risk, and since they would be held accountable for murdering an innocent person, they wouldn't be as trigger-happy or dangerously aggressive. They would have no incentive to meddle and look for "drugs" or weapons which have nothing to do with their business, but would need to limit themselves to the business at hand. I know I'd feel better calling these guys for help. No "system" would be perfect, but the only advantage cops have now, as "first responders", is that they have a dispatcher and a standardized phone number. You can't usually call just one number and have immediate response and backup- if you call your friend and he doesn't answer the phone, you may not have time to make a second call. So, most people call the cops even knowing there is no situation so bad it can't be made worse by inviting a cop into the mix. This idea would fix that. Yes, I realize cops and those who worship them would object to this idea- and fight you with every "law" they could dream up. After all, something like this would expose just what a bad idea cops are, and how dangerous and worthless they have become. "We" can't have that, now, can we?